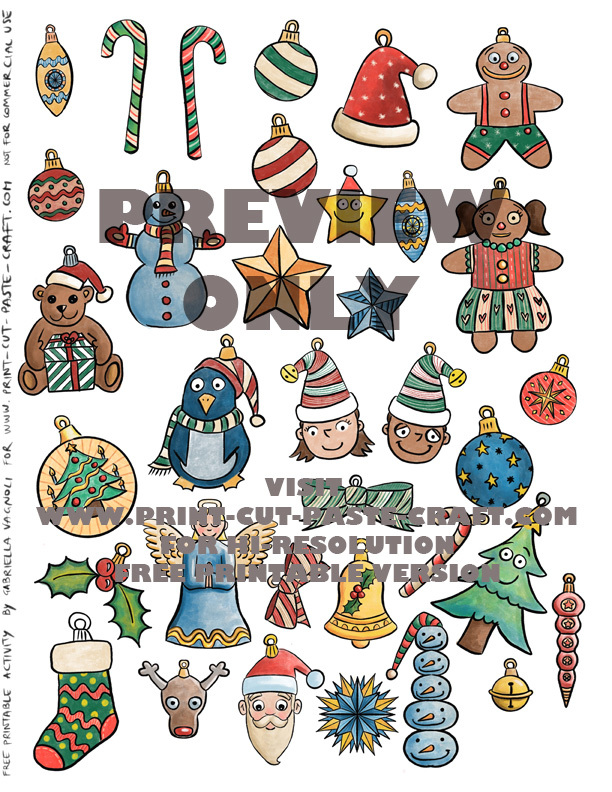 Party and Holidays | Print, Cut, Paste, Craft! Here is a new free printable Easter game! 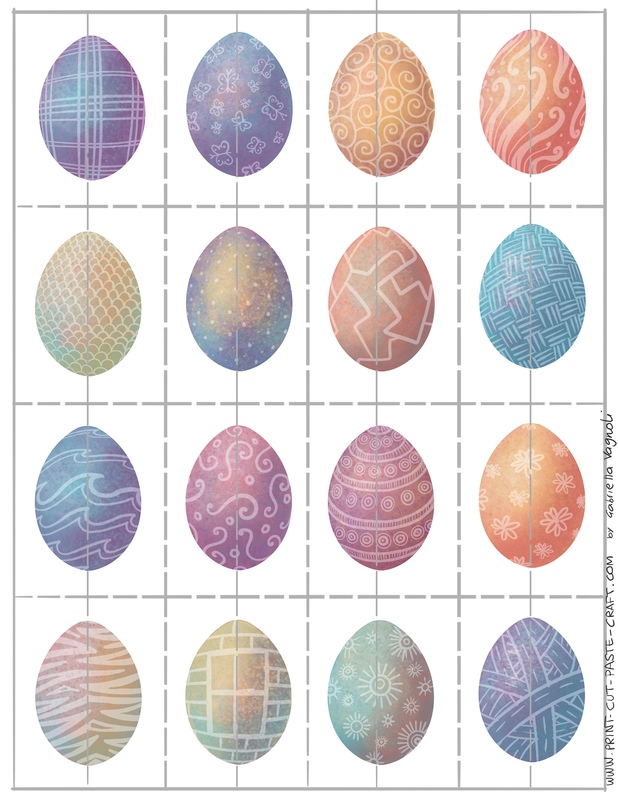 All you need to do is print the eggs in color on cardstock paper and cut along the dotted lines. You will end up with 42 half eggs. Spread them on the table face up and challenge your kids to find as many matches as quickly as possible: the person with the most matches when the cards are all gone wins! Another, slightly harder, way to play it is to put the cards face down like in a game of Memory; the players take turns to flip the cards and a match is made when the two sides of the eggs match. 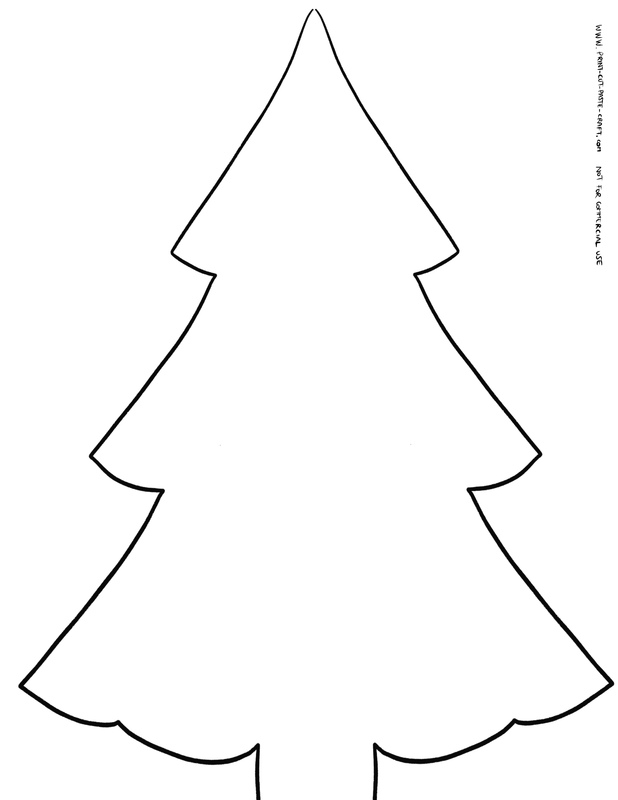 It is fun, it is simple and you can print it at your own house! Tie the cards with a ribbon or put them in a small snack ziplock bag and add them to the kids’ Easter Basket! 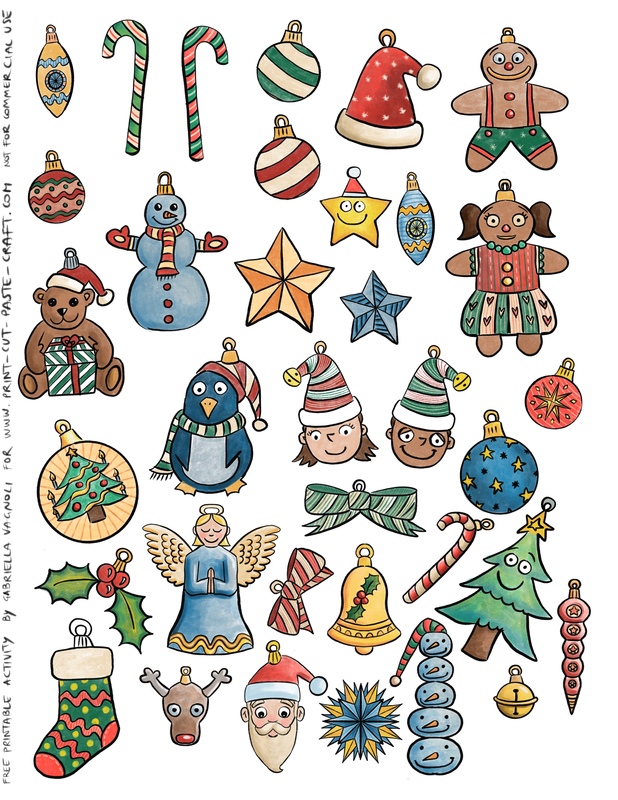 Together with the free printable maze they make a great addition to any basket! Just right click on the image to print it and enjoy! Easter is coming soon! 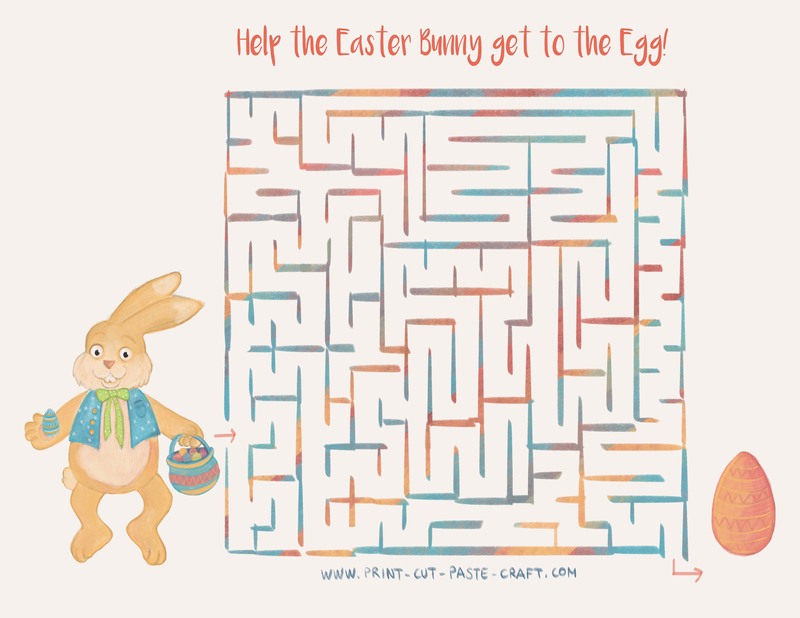 And while we wait for spring to also decide if it’s here to stay or not, why not entertain the kids with an Easter free printable maze? It could be also something fun to add to your easter basket together with some crayons, especially if you are trying not to fill it up only with a ton of candy! You are welcome and lookout for another awesome Easter activity coming very soon! Just right click on the image to print and enjoy! 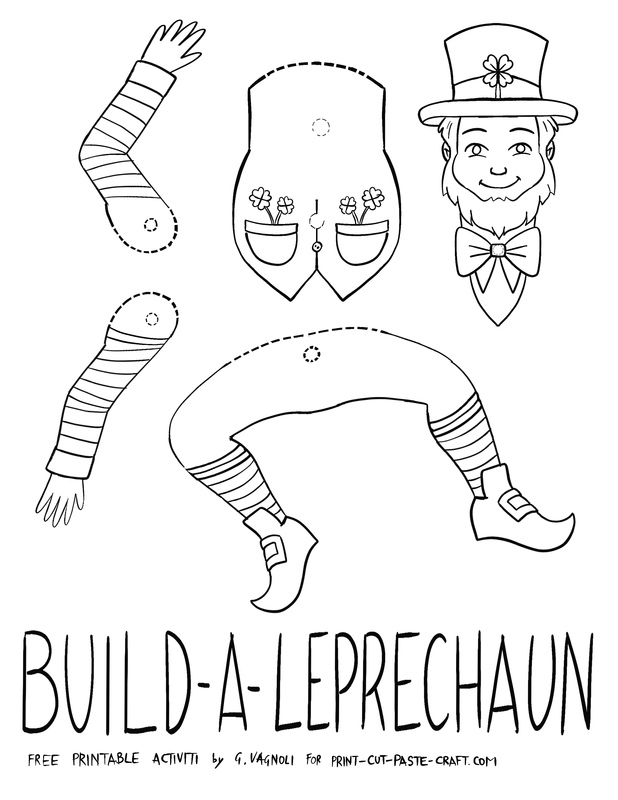 Here is another fantastic free Saint Patrick’s day activity: build your own Leprechaun!! All you need to do is cut out the parts (as you can see from the photo above you don’t need to be super precise about it, especially around details like the fingers!) and fasten the different parts with metallic brads. 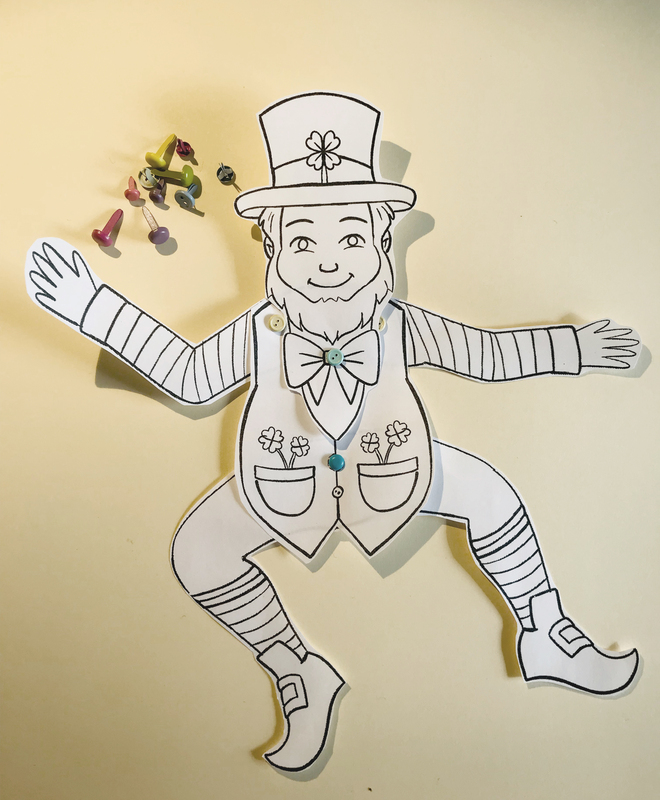 I was lucky to have some that actually look like buttons which I think adds a lot to the look, but any kind of metallic fastener will work, and voila’ you have your own dancing Leprechaun!! I have, as usual, created both a black and white version and a color version, in case any of you want to color your own or don’t have a color printer available. Enjoy, and don’t forget to send me pictures of your projects! I love receiving those!! 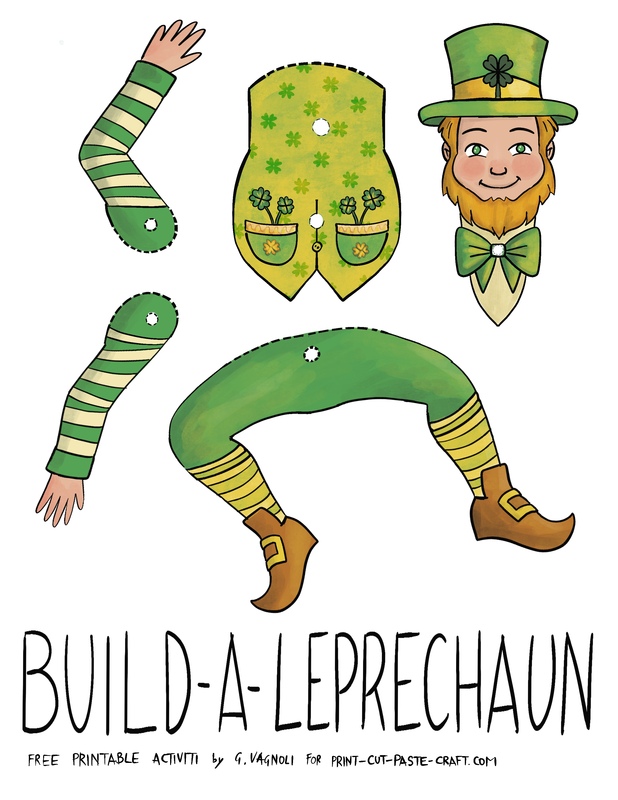 Call it Saint Patrick, Saint Paddy or Leprechaun day, it is coming soon! I know my kids are excited to start building traps for the Leprechaun and hope to get him and his treasure! 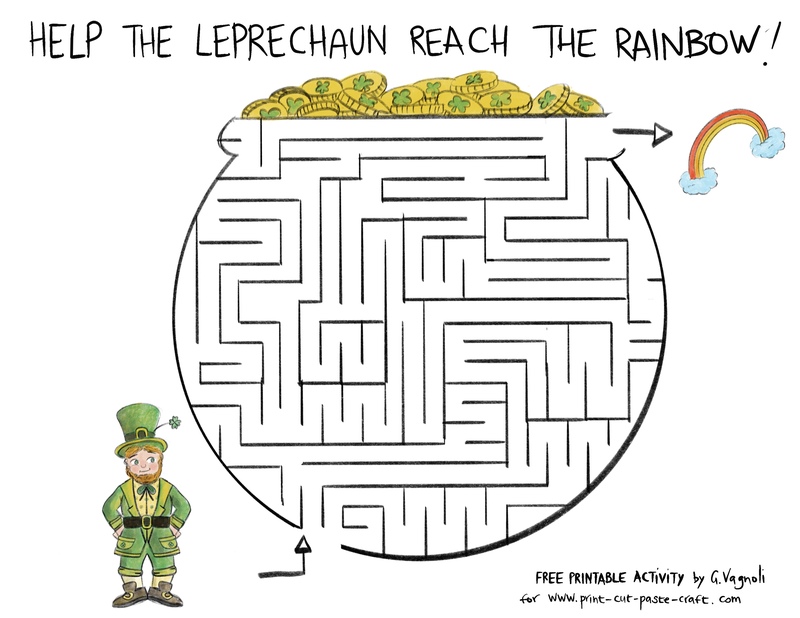 Here is a fun little maze activity if you are planning a class S.Patrick’s day party, or to do at home. As usual, it is free and it is not for commercial reuse. Click here to download the full resolution jpg. With Valentine’s day coming soon you might, like me, find yourself scrambling to get about 30 cards with candy ready for your kids to share with their classmates, and if you have more than one kid in elementary school it could easily be that your number is more like 60 or 90 cards! Yikes! 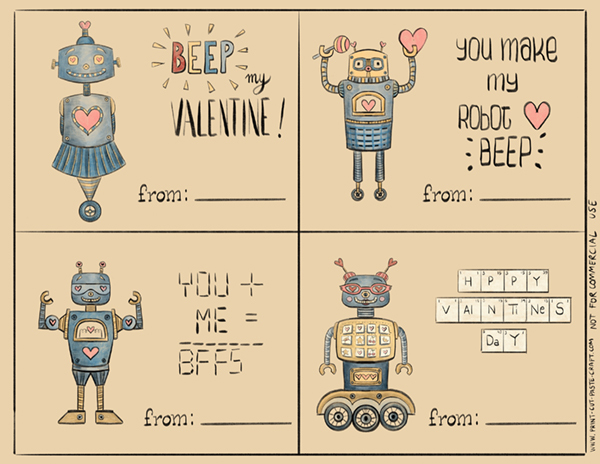 Here is an adorable set that you can easily print at home! I recommend using cardstock so it is nice and thick and then cut it up and add a lollipop and voila! All done! 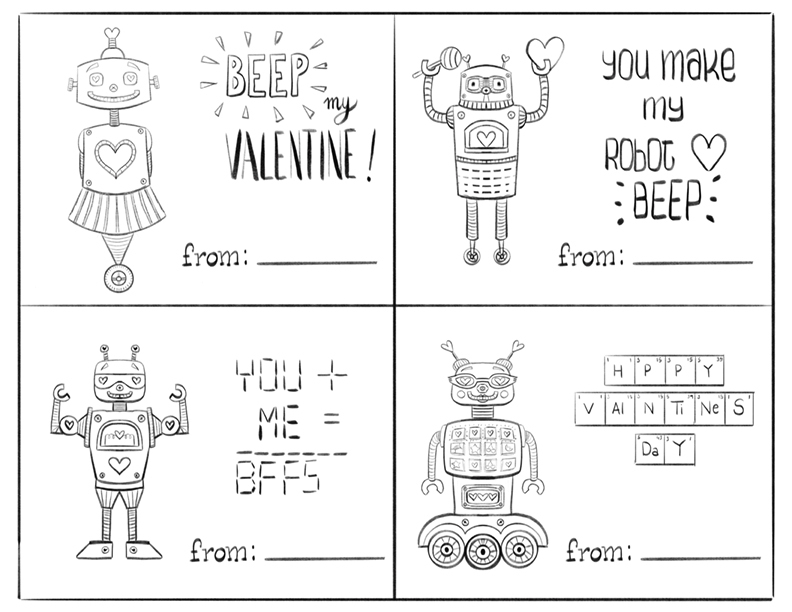 Or HERE if you’d rather get the Black and White and have fun coloring in the robots however you like .